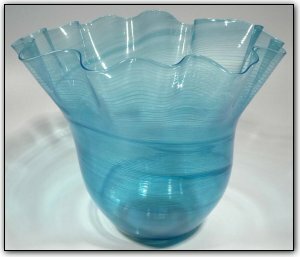 This light blue transparent bowl was made using with very thin canes resulting in a bowl that is both thin and elegant. Working with canes is a time consuming two-stage process. First Dirwood hand pulled the canes used to make this bowl, and then he made this stunning bowl using those canes. There are two things about this that need to be pointed out since they are hardly noticeable unless you are looking for them. In one picture you can see that there is no color where the bowl was attached to the punty (the punty is the pipe that the bowl is attached to during the blowing process). There is also a noticeable dark circle on the bottom where the bottom was flattened visable in that same picture. Neither of these "flaws" are noticeable when the bowl is displayed on a table and we are offering this bowl at 50% of what it would be otherwise priced at due to the ever so slight and out of sight imperfections.